Another critter bad guy for any genre. 28 animations and ships with 20 different textures. But still pictures do not do him any justice, so click here and see him in action :D. And the link to a more in depth description here on the Unity Assets Page. The ideal bad guy fodder for any Sci-Fi or Fantasy setting. 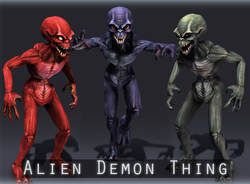 28 animations total and ships with 8 diffuse textures. To give the animation set a look, click here. To check out the full write up at the Unity Asset Store click here. 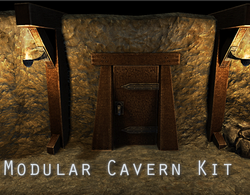 A modular kit for making caverns and such. a whole series of different corners and walls that snap together nice and easy using the magic of "K" and snapping stuff together. Also included to dress up your caves are some torches and a big floor sconce (bowl of coals), some assorted rocks and wooden support beams. To get a decent idea of what you can put together with this check out this. The direct link to check it out at the unity store is right here. 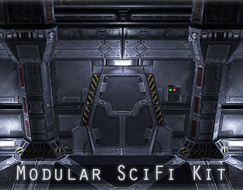 A modular kit for building a science fiction base type setting, Ideal for an isometric or real time strategy style game. Set includes walls pillars and floors for fleshing out the main shape of your base. 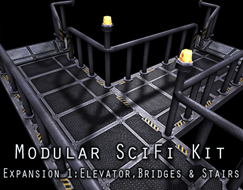 Also included are upper wall and pillar sections for building multi-level rooms. To round out the pack there is also a fully animated door (3 peice sliding style), wall console, light fixture and some piping to dress up the upper wall sections. This is all snap together (V key in unity) friendly as I find its one of the fastest ways of building in unity. 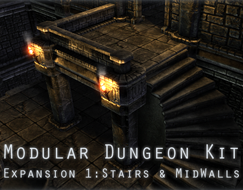 First off this expansion requires the original Modular Dungeon Kit as it is built to snap to the existing structures and allow you to create multi-level dungeons. The kit includes a total of 8 variations of stairs and the mid components for extenting walls and pillars between dungeon levels. Also included is a shorter pillar and wall (hand railing size) for closing in balconies or other areas you dont want your players falling off of. Im currently working on a tutorial for using both the modular dungeon and this expansion together, as its designed to snap together using just standard vertex snapping (CTRL+V) so you can generate a very large multi-level structure in a very short amount of time......As soon as its up there will be a handy link right about here. 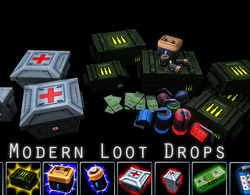 This is a collection of your standard loot drops that you would need in lets say a nice modular type dungeon :). Set includes potions in 3 sizes (6 color options), scrolls (6 colors), money piles in 3 sizes (each in gold, silver and copper) and a chest to put it in. Also included are icons in both 64x64 and and 128x128. 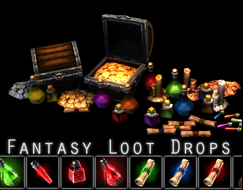 And in case 6 variations on color isnt enough for what your thinking of creating, I've also included the zipped up PSD texture of the potions and the scroll. These PSD's have the contents of the bottles and the scroll seals masked out in an adjustment layer along with the associated icons. So all you need to do is make changes to the hue to create not only the new colored potion or scroll but your also generating your icons to match. Also forgot to mention on the unity page, but the money comes complete with bling particles.....just enough sparkle to really really make yer players want to pick it up :). This is a collection of modular pieces for scratch building an isometric style dungeon. 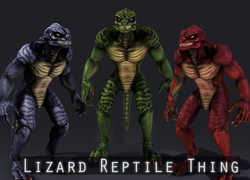 The components are low poly and make use of normal and specular maps to give it an illusion of depth. The pack includes pillars, walls (one solid, one with a door sized hole in it), floors, an arch way and a door. Also included are torches both lit and unlit making use of the new Shuriken particle system in unity, and a demon statue that I included to make the place just a lil less empty. With Frills - this is after some tweeking and better lighting and some of the fancy turned on to give you an idea of what can be done with the package. 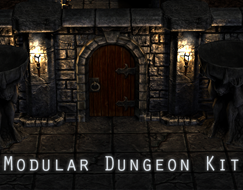 Click here to go directly to the Dungeon Kit unity store page. 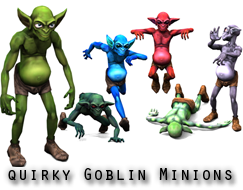 Quirky goblin minion is a fully rigged character for unity, including a full set of animations and 6 different textures. Click here to check out the animations. Also to get an idea of how he looks ingame, he is present in both of the above dungeon examples.....but he's pretty itty bitty.